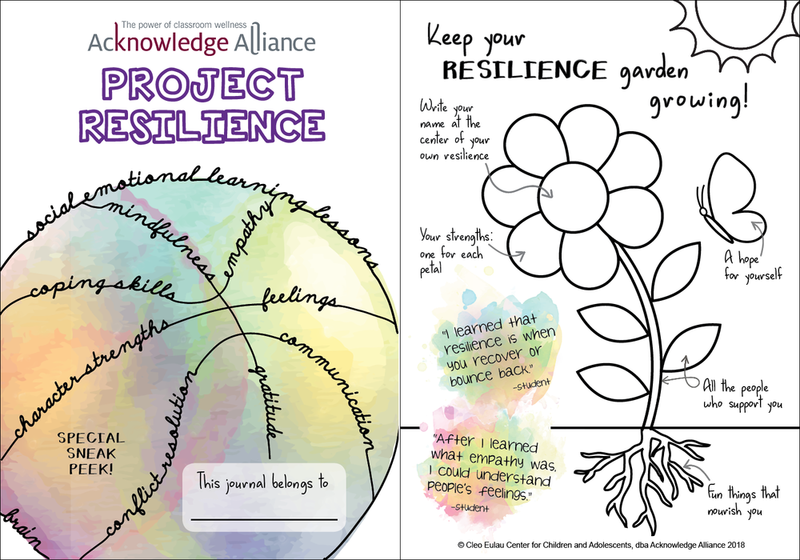 We hope you enjoy this special “sneak peek” edition of our Project Resilience journals for grades 3 through 7. Our team of mental health professionals created and designed these journals for the students we serve. Every booklet is filled with many pages of valuable lessons and opportunities for self-reflection that are unique to each grade level. Our curriculum is all about social emotional learning (SEL) and helps students and teachers learn and practice essential lifelong skills like regulating emotions, understanding the brain, using problem-solving strategies, and making good decisions. Everyone can build their resilience through a strengths-based focus and through connecting with others, which is the foundation of our program. In addition to a variety of creative activities, Acknowledge Alliance staff lead mindfulness and gratitude practices in each lesson. And in that spirit, we extend our deepest gratitude to YOU for being a part of our mission to create more resilient school communities where students feel safe, seen and heard. In this past school year, Project Resilience touched the lives of 3,340 students! When asked which SEL topics were most useful, the top two categories that students reported were mindfulness and character strengths, followed by communication skills and coping with feelings. As we invite you to make a year-end gift, know that our reach and impact is not possible without your investment. Today more than ever, students face complex challenges in their lives that impact their ability to focus on learning. Many students live in poverty, experience high familial stress, cope with depression, battle immigration issues, and/or are exposed to traumatic events, like abuse and violence. With our resilience-building tools and training, we are not only reaching these students but also supporting educators so that they can maximize their positive impact on youth and overcome teacher burnout. Will you please join us in supporting our students and educators? We are excited that this year, your gift will have even greater impact! The Morgan Family Foundation will award us a matching grant of up to $25,000 for every new and increased gift donated. We are grateful for you and the difference you are making. Thank you! Older PostAiring Now on TV! Copyright © 2019, Acknowledge Alliance. All rights reserved.